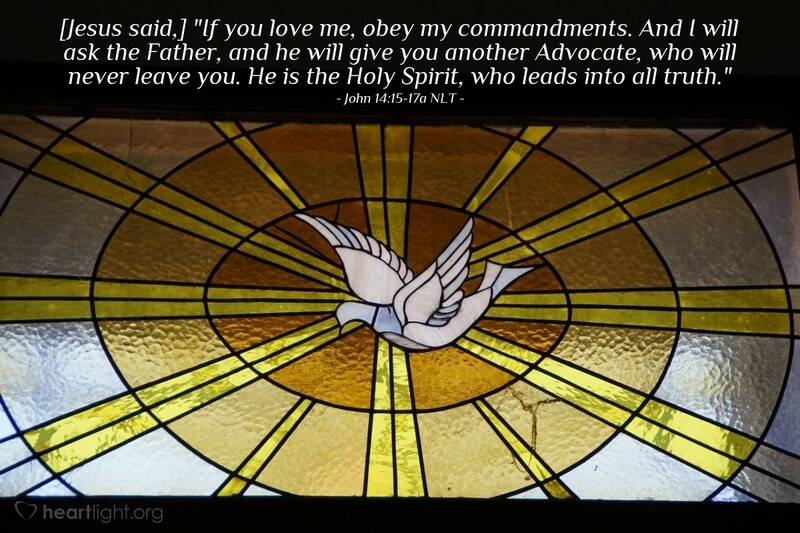 [Jesus said,] "If you love me, obey my commandments. And I will ask the Father, and he will give you another Advocate, who will never leave you. He is the Holy Spirit, who leads into all truth." Translators have tried to capture the essence of the Spirit's role as revealed in the word Jesus used here to describe the Holy Spirit. Different versions use Advocate, Comforter, Counselor, and Helper to translate the original Greek word "paraklaetos." Looking at all of these words helps us get an idea of the scope of the Spirit's work in us. But the point of Jesus' other words must not be overlooked: The Spirit will never leave us, and the Spirit will lead us into God's truth. No wonder the gift of the Holy Spirit was so anticipated by the Old Testament prophets as the sign that God's new age of salvation had come, and no wonder the early Christians saw this gift as crucial to one being a true follower of Jesus! Let's give thanks for this gift and cultivate our hearts so that the Spirit finds a welcome and receptive home in each of us. My righteous and loving heavenly Father, I thank you for your many gracious gifts, and I especially want to thank you today from the bottom of my heart for the wonderful gift of the Holy Spirit. I open my heart to receive the grace, comfort, correction, conviction, and love you want to pour into my life through the Spirit. In Jesus name, I offer my thanks and praise. Amen.